Avatar: The Last Airbender is an Asian fantasy animated television series that aired on Nickelodeon from February 2005 to July 2008. Co-created by Americans Michael DiMartino and Bryan Konietzko, it is about a boy and his friends on a journey to end a hundred-year war. Water. Earth. Fire. Air. Only the Avatar is the master of all four elements, and only he could stop the ruthless Fire Nation from conquering the world. But when the world needed him most, he vanished. Until now... In the South Pole, a lone Water Tribe village struggles to survive. It's there that a young Waterbender named Katara and her warrior brother Sokka rescue a boy named Aang from a cavernous iceberg. 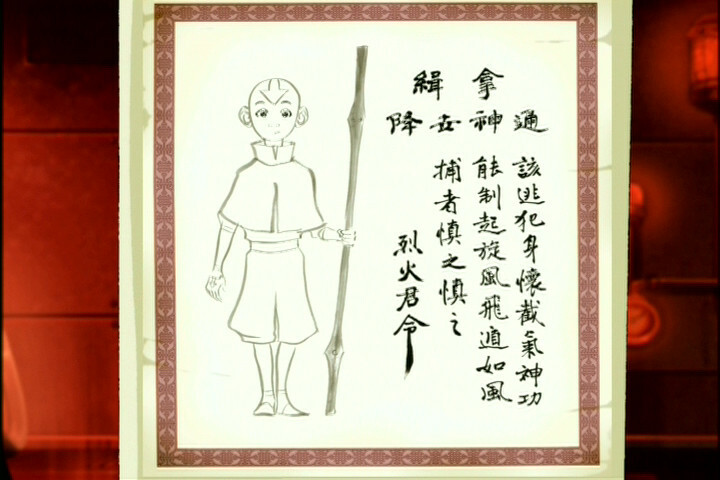 Not only is Aang an Airbender --a race of people no one has seen in a century-- but they soon discover that Aang is also the long lost Avatar. Now it's up to Katara and Sokka to help Aang face his destiny and save the world. Did we mention he's only 12? Aang (12), the Avatar and a forgiving, fun-loving kid; Katara (14), a compassionate and stong-willed Waterbender who wants to master her element; her brother Sokka (15), the meat and sarcasm guy, with a chip on his shoulder; and in season two Toph (12) joins the team, a confrontational and powerful blind Earthbender. Together they travel on Appa, a flying bison that's been with Aang for many years; and Momo, a flying lemur. Persuing them is the banished Prince Zuko (16), a tortured soul looking to regain his honor. With him is his uncle, Iroh (60s), a retired general with infinite wisdom and a love for tea. In season two Zuko's sister Princess Azula (14), manipulative and cold-hearted, begins her own pursuit. Joining her are her two friends, Mai (15), a bored governor's daughter with pin-point knife throwing skills; and Ty Lee (14), a free-spirited acrobat with chi-blocking punches. You can find more info in the Characters section. 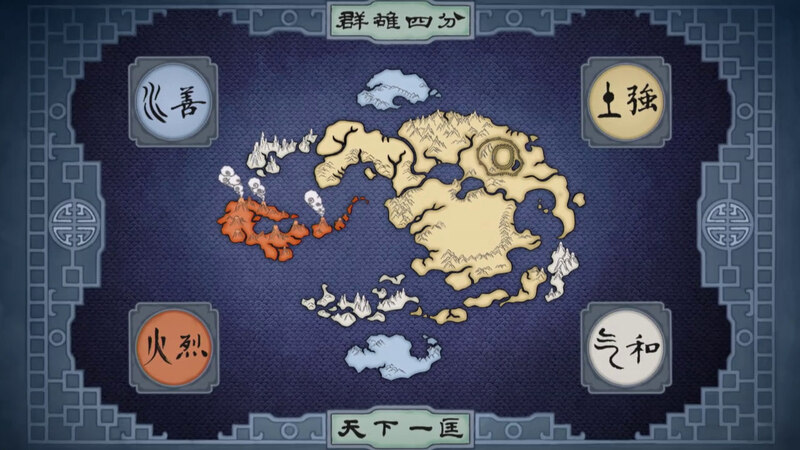 The Avatar world is similar to Earth, but is made up of four nations; the Fire Nation (red), the Earth Kingdom (brown), the Northern and Southern Water Tribes (blue), and the Air Nomads (white) who have mountainous temples in the four corners. There is a heavy Asian and Inuit influence in the represented cultures, as well South American, Indian, and more. All of the writing in the show is Classical Chinese, accurately written and translated by consultant Siu-Leung Lee, PhD. The writing is used in all of the nations, and the style even varies depending on what character wrote it, whether a low-ranking officer or a royal proclamation. The people generally have eye colors and clothing that reflects their nation, like Water Tribe have blue eyes and Earth Kingdom have green eyes. There are also people who can manipulate the element of their nation, called benders. Waterbenders, Firebenders, Earthbenders, Airbenders. It is unknown what determines who will be a bender, but it seems to be a mix of genetics and spirituality. The bending forms use real-life martial arts, with specific styles used for each element. Example, Firebending uses Northern Shaolin, and Earthbending uses Hung Gar, though Toph's style uses Southern Praying Mantis. The Avatar is a spiritual being in human form that can manipulate all four elements, and acts as a bridge between the living and the spirit world. There can only be one Avatar at a time, and will reincarnate within a week of the Avatar's death, being born into the next nation in the cycle. (Water, Earth, Fire, Air.) The Avatar can also call upon the previous Avatars by going into the Avatar State, and use their collective strength. There are also a plethora of animals that are hybrids of real animals, like Platypus Bears, Turtle Ducks, and Ostrich Horses. There are a few animals that are not hybrids (like the Earth King's pet bear), but they are very rare. You can learn more in the Info section. The show was co-created by Michael DiMartino and Bryan Konietzko, with additional writing by Aaron Ehasz, Tim Hedrick, John O'Bryan, Elizabeth Welch Ehasz, and Joshua Hamilton; and directed by Lauren MacMullan, Dave Filoni, Giancarlo Volpe, Ethan Spaulding, and Joaquim Dos Santos; along with the many others in designing, painting, storyboarding, consulting, animating, and more. Storyboarded at Nickelodeon Animation Studios in Burbank, California, and animated in South Korea. Music by The Track Team. Voice talents included Zach Tyler Eisen as Aang, Mae Whitman as Katara, Jack DeSena as Sokka, Jessie Flower as Toph, Dee Bradely Baker as all of the animals, Dante Basco as Zuko, Mako and Greg Baldwin as Iroh, Grey DeLisle as Azula, and Mark Hamill as Fire Lord Ozai. Avatar: The Last Airbender marks Nickelodeon's first try at Asian-influenced animation. Co-creators Mike DiMartino and Bryan Konietzko found inspiration in a host of influences, including Taoism, Buddhism, Chinese art, Japanese animation, and Asian live-action films. Konietzko went the extra step, studying with Northern Shaolin Kung Fu teacher Sifu Kisu to learn martial arts. The series was aimed at Nick's core audience, ages 6-11, but the creators hope adults like it, too. �The story is deep and sophisticated, but it works on a lot of levels,� Konietzko says. Production time took 9-10 months just to complete one episode. Because of this, they often worked on many episodes at the same time. Quote Mike & Bryan: "A massive amount of work went into getting the animations just right. Tin House in Seoul is the best. For those not in the know Tin House did Wonderful Days/ Sky Blue in the US. They made our visions a reality in their powerful and unique methods of combining 2D, 3D, model miniatures and particle arrays. This has never been used in an animated series before. The speed, timing and geometry of the characters had to be just right and they worked very closely with traditionally trained martial artists. The animation and story board staff even went as far as participated in Northern Shaolim training and conditioning classes (bless their aching legs!) in an attempt to understand the essence of what they were drawing. The magical powers of all four tribes are firmly rooted in the Chi Gung traditions of Chinese martial arts as well as the geometries of movement stillness and transitions." The Air Benders for instance based their skills on the movements of Bagua, the Fire benders on Northern Shaolim, The Earth Kingdom on Hung Gar and the Water tribe on Ku style Tai Chi. ( a style of Tai Chi passed on in the Ku Yu Cheong Lineage.)" The show's popularity spurred merchandise like specialty LEGO sets, a trading card game, a roller coaster, a series of comics, an art book, a live-action film, as well as the cartoon series sequel The Legend of Korra.